Happy Valentines Day Everyone! My boyfriend wrote up a great post about it, so you can check out his site if you feel like it. (see left.) This is just about the only time I can remember having a boyfriend on Valentines day, and it is ironic to be spending it 2,068 miles away from him. I am currently sitting at an internet cafe in el centro, sweating, and listening to loud hipsanic music drift in from the street. I will gladly take the sweat over the freezing temperatures in Denver right now. My town in Honduras has grown on me and I am feeling more confortable in it. I can now see its beauties and charms. I think I have also found some good work that I will be able to do here. This morning I talked to some women who are staying at the Albergue at the hospital. Women who live in the hills (who are mainly of Lenca decent) cannot give birth out alone in the country (or they chose not to,) so as they near the end of their pregnancy, they move into an Albergue at the hospital. It seems more like a makeshift village. The woman cook their food and wash their few clothes outside and sleep on old hospital beds. Most of them have no idea how long they’ll be there or when they’ll deliver, as they have never had an ultrasound. There are six women in the albergue now. Once they got over their shock at seeing a gringa, we had a great converstaion and they have tons of questions about their own nutrition and health, and how to feed their children. I will spend some time this afternoon making two posters to present to them tomorrow. One on birth control and one on nutrition during pregnancy. One of the most basic things they could do for their health and the health of the babies is to get enough to eat, as most of them are hungry most of the time. The food here in town is too expensive for them to buy. My host family has a cat, two dogs, an assortment of chickens, a very loud rooster, and I think we have some cows too. There are probably other things I am missing. Anyway, I asked the woman who does our cooking if its a problem having the dogs and chickens together. “What do you mean?” “Well, my dog would try to eat the chickens.” “Oh, it is the same here.” “umm, OK, I said.” Aparently, this is not a problem. Last weekend, all fifteen of us gringo volunteers in town took a trip to nearby lake Yojoa, the largest natural lake in Honduras. It was a great chance to get out of La Esperanza and see a bit more touristy area of the country. I loved the lake, though it might have had something to do with the very welcome lukewarm showers. 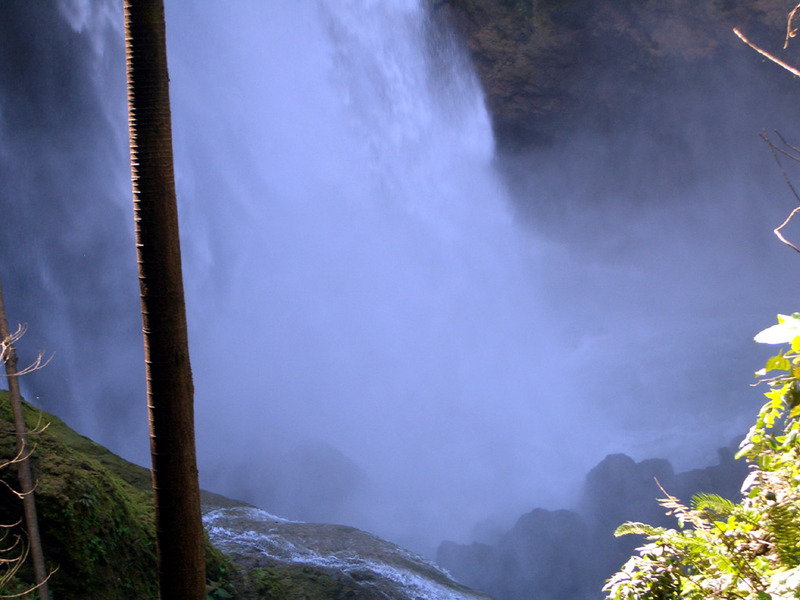 There are some relatively famous waterfalls (cascadas) close to the lake. We had all heard of them from people who had been in country awhile and from our guidebooks. Our in-country program coordinator explained that we could get a guide to walk us behind them. She said that there is about “10 seconds” where there is lots of water and its a tiny bit scarey, but then you are behind them and its beautiful. She had painted this image of a tranquil tropical waterfall, with a breif, easy walk we could take to float behind it. So, Saturday we made our way out to the falls. As we walked in the entrace gate, a young man introduced himself as a guide to the falls. We negotiated a price, stowed our bags, and he led us down to the bottom of the falls. He undid a lock on a gate blocking off a trail along the rocks. We were a good little hike in when he finally thought to ask, “Can everyone swim?” As soon as we all nodded our heads, he took the first pluge of the day, about a 7 foot jump into a calm pool of water. We followed. We climbed out on the other side of the pool and continued to follow the guide closer to the falls. There is nothing peaceful or tranquil about a 43 meter waterfall. The water hit the ground with an incredible force. The spashback began to get thick, and it was getting difficult to see. I began to think that we must be just about done with the “10 second” part with lots of water when the guide turns to me “Ok, this next part has lots of mist. Don’t be scared. Breath through your mouth.” We all linked arms and followed our guide further into the falls. I couldn’t see at all, it was difficult to breath; water came up from all directions. We waited as all of the volunteers made their way through, and proceeded further into the falls. We got out of the worst of the mist and the guide says, “look up.” And there we are, standing behind a 43 meter waterfall. We weaved in and out of some of the caves around the falls on our way back out. As we neared the exit to the falls, the guide pointed out a 10 meter jump into some relatively calm water. He said it was safe and that people could jump if they wanted to. All the boys made the plunge. I had to follow. It was high enough for you to actually have some time in the air to think about the fact that you were flying. Overall, the expiernce provided one of the best adreneline rushes I had had in a long time, and comes strongly recommended. One of the most humorous aspects of the weekend spent traveling was the difficulty my British counterparts had traveling in a country that doesn’t have time tables. If you want to take a bus, you walk to the the road the bus goes on and wait for it to come. You might wait 2 minutes, you might wait an hour, but you just sit and wait. The Brits couldn’t stand not knowing when we would get to wherever we were going. I guess that’s what happens if your country has an incredibly efficient, and timely, train system. Erin— I am loving your blog—- while you enjoyed your Honduras Valentine’s Day we got our first really big snowstorm of the season so no school or work, which was nice! We had a great time with your folks in Vermont last month— you know you are good friends when you can talk nonstop for three days, laugh constantly and still have more to say– it was cold, but we had some good skiing and more food that we needed!